Finding the perfect food bowl for your hamster can be quite a challenge. There are a lot of products out there, and some lack the qualities to be an acceptable option. They’re either not durable enough or are too much of hassle for your hamster to use. There are also some that are too visual unappealing to be a good option; there’s nothing fun about a stainless steel bowl after all. These bowls should also be chew-proof and be able to prevent your hamster from tipping it over. It’s little things like these features that separate the high-quality hamster bowls from the low-quality. With this in mind, we thought it’d be a fun idea to find high-quality food bowls with adorable designs. And after some significant research, the following options are the ones that stood out. So please, keep reading and enjoy the adorable food bowls we explore down below. 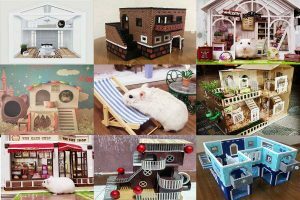 Trust me; each one of them will brighten both you and your hamster’s day. The Kaytee Cabbage Vege-T-Bowl has a cabbage design that’s almost too cute. It’s almost like your hamster will be eating their dinner out of one their favorite treats! But this cute design isn’t all it has going for it; it also is made with chew proof ceramic and lead-free paint. These two qualities ensure that this bowl is both completely safe and durable. Given this information, you should expect it to be in your hamster’s life for a long time. And since it’s dishwasher safe, it won’t represent a nuisance in your life either. Another added benefit is it’s available for an affordable price. Plus, it’ll add color and fun to your hamster’s cage. It’s a simple way to add some spice into your hamster’s life that can get rather mundane at times! 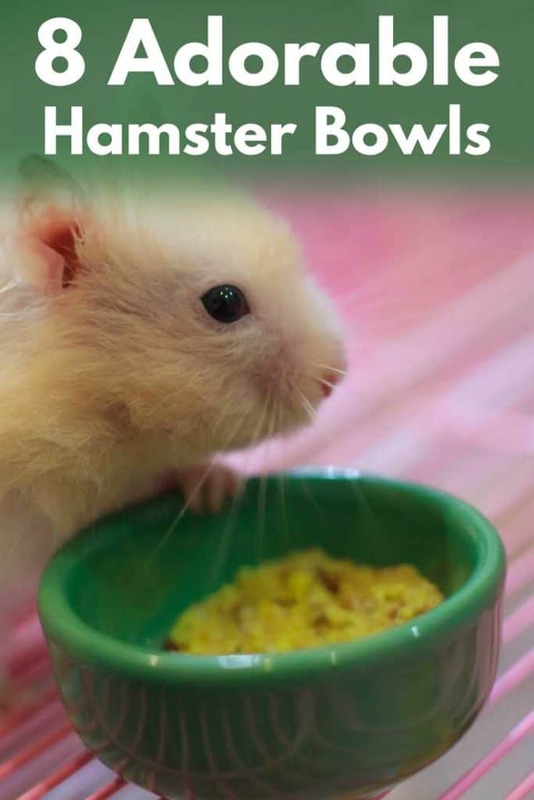 Click here to view this adorable hamster bowl on Amazon! The best part about the OMEN Hamster Bowl is you have a choice regarding the design. You can either choose a watermelon (like the one pictured), kiwi, or grapefruit. It’s all up to your particular preference because each design is adorable. Aside from giving their customer a choice, this bowl is also made from high-quality, gnaw-proof ceramic. The ceramic material helps in preventing your hamster from tipping the bowl over. In fact, if your hamster does tip it over, it would be a borderline miracle. This material’s also helpful because it doesn’t absorb food colors or odors. You’ll never have an issue with this food bowl becoming unusable because of the smell its picked up over-extended use. When it does become dirty, the cleaning process is incredibly simple as well. Just wash the bowl with soapy water, rinse it out, dry it, and it’ll be good as new. Another product from Kaytee that was too adorable not to mention is the Kaytee Carrot Vege-T-Bowl. As its name would suggest, it’s designed to look like a carrot. And the results are too cute even to comprehend. But it doesn’t lack in other impressive features either. It can hold up to 22 ounces of hamster food, which will more than satisfy your hamster’s needs. It also is made from the same chew-proof ceramic and lead-free paint as the previous Kaytee product. It being dishwasher-safe is another similar nice touch it shares with its fellow Kaytee product. But again, it holds more food and features a vastly different design. Either way, this bowl would represent an incredible buy for a hamster’s habitat, especially, if he’s a fan of carrots. This colorful food bowl from Alfie would be an excellent addition to your hamster’s cage. It’s made from high-quality ceramic, which ensures this bowl both cleans easily and is difficult to overturn. These two qualities are fundamental in finding a high-quality food bowl for your hamster. And as with the other ceramic bowls in this article, this product is chew-proof as well. The inclusion of a second bowl is also a nice touch. It’ll give you both a food and water bowl for a price that would usually only get you one. If that isn’t a bargain, I don’t know what would get labeled as one. But none of these features is the best part of this product. This title instead goes to the “I’m Hungry” text inside the bowls, which is just so darn cute! I mean, it meshes perfectly with the outside color and will for sure brighten up your hamster’s cage. Another two-bowl set that comes at an affordable price is the Kathson Stoneware Hamster Food and Water Bowls. But the two bowls feature an entirely different design in this two-piece set. One of the bowls is a beige color with drawings of hamster faces around the outside. As far as adorable hamster bowls go, this design is rather simple but extremely effective in being cute. It also has “Feed Me!” written on the inside, which increases the cute factor. The other bowl merely is colored with a blue interior; nothing too remarkable about it, but it will add some color to your hamster’s cage. Aside from their color design, these two bowls are sturdy thanks to their ceramic construction; it will be worn down by chewing or tipped over by a rambunctious hamster. The beige colored bowl has arced top for easy food access as well, which is another beneficial feature. Our second product from Alfie has a charming design with painted on hamsters around its interior and exterior. 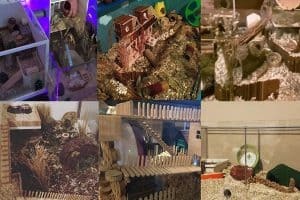 I find it to be something I could see my hamster genuinely enjoying. It also happens to be another two-piece set, which offers a great deal of convenience. No longer will you have to worry about not having high-quality water or food bowls; Alfie has you covered with this package deal. Besides its design and being a two-piece set, there isn’t much else about this product that we haven’t covered previously; made from sturdy ceramic, doesn’t allow for tipping over, chew-proof, easy to clean, etc. But it’s worth noting this particular product is the most expensive on this list. So, if you don’t find the design as charming as me, there’s no reason to spend extra on this bowl. This bowl from Wildforlife is very similar to the beige bowl from Kathson Stoneware two-piece set. It even has “Feed Me!” written on the inside just like the other one. But I find this one’s green coloring and outer design to be a little bit more appealing as it’s more vibrant. Plus, it has all the other wonderful qualities the previous product has as well: arc top, sturdy base that prevents tipping over, easy to clean, etc. All of this put together with a better color scheme and an affordable price makes this product hard to beat. And since it’s a little bit smaller in size, it becomes an ideal purchase for a dwarf hamster owner. 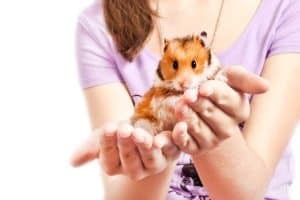 In fact, if you do have a dwarf hamster, there isn’t a better option on this entire list. This bowl will fit your hamster’s needs to a tee. It also helps that those hamster faces on the exterior look so sweet and lovable! Our last product also happens to be this writer’s absolute favorite. The reason it’s is my favorite fantastic quality of being animal shaped, which is just spectacular. It even gives you a choice between what animal you want the bowl to shaped like: panda (as seen in the picture above) or frog. Both designs are tremendously cute and will liven your hamster’s cage immensely. Besides the creative design this product offers, it also contains all those essential features of a high-quality bowl: sturdy construction, an easy cleaning process, non-toxic material, etc. But it’s worth noting that this bowl’s one of our more expensive options; therefore, if you aren’t crazy about the animal shaped design, there isn’t a reason to pick it over another bowl. It just wouldn’t make a lot of financial sense. After seeing all these adorable hamster bowls, which one was your favorite? Leave a comment down below and lets us know. We’d love to hear your feedback!